About: Bar Soho serves a wide selection of beers,wines, spirits, cocktails and snacks. Seating on the pavement area is provided, weather permitting. "Half price drinks pack in the punters"
It never ceases to amaze me quite how many people flock to Bar Soho, or to any of the bars that fill Old Compton Street for that matter. With the sheer amount of drinking holes in the area you’d think there’d be at least the odd bar that struggles with the competition, but no, every single one is full to the brim, especially at weekends when finding space to exhale can become a chore. Each time I walk in a handful of empty tables with ‘reserved’ signs tease me, and we end up standing at the bar. The large bar is the focal point of the room; the floor isn’t smooth and the décor is nothing to write home about. It’s functional, one could say. A big draw for Bar Soho is their happy hour where every drink is half price, every day from 5 – 8, attracting after-work drinkers and Soho-ites galore. It’s certainly one of the more generous happy hours around considering you can get a bottle of vino for around £7 or a Mojito for £3.90, just don’t expect fine wine. There are seats outside and overhead heaters for when the crowds and blaring of Britney Spears gets too much; there is also a smaller room upstairs with a little more character, brick walls and a smaller bar to one side, but still the same cheesy music. Their menu also has cheap pub treats such as pies, Thai curries, fish and chips, and burgers, with most dishes around £6 or £7, although I’ve never witnessed anyone eat anything here. Essentially I’d recommend Bar Soho to anyone on a student wage or similar; as run of the mill bars go it serves its purpose well. The service at this bar was dissapointing. I would not recommend it to anyone. They also have a bizarre ID policy which put a friend who was over 30 out. I was at Bar Soho at teh begining of December for a last minute night out. I just want to say the cocktails were amazing and they play music to cater for all. There is a small bar upsatirs that was playing house music and teh main room was play comercial chart tunes. The girls and I have a great night (happy hour is 50% off) drinking wine and cutting some shapes on the dancefloor. 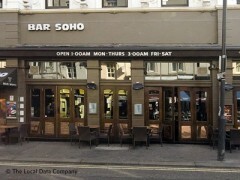 Watch out Bar Soho as we will be back in 2010.